Glastron’s GTS 205 is the sterndrive-powered version of its three twenty-foot GTS models – the other two being outboard and jet-powered. 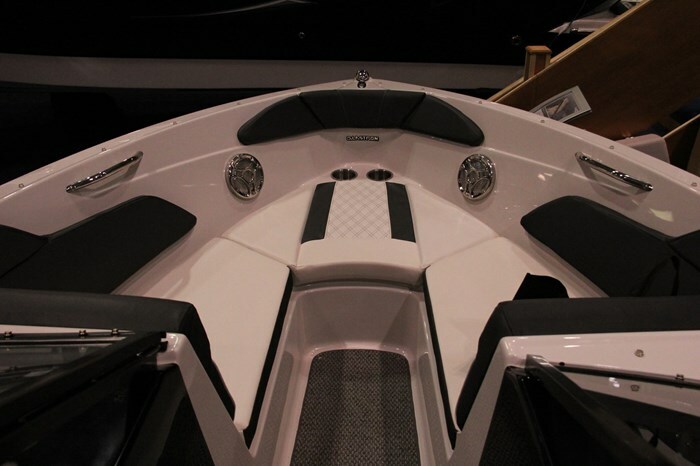 These three comprise part of the ten model GTS bowrider series ranging from sixteen to twenty-four feet. 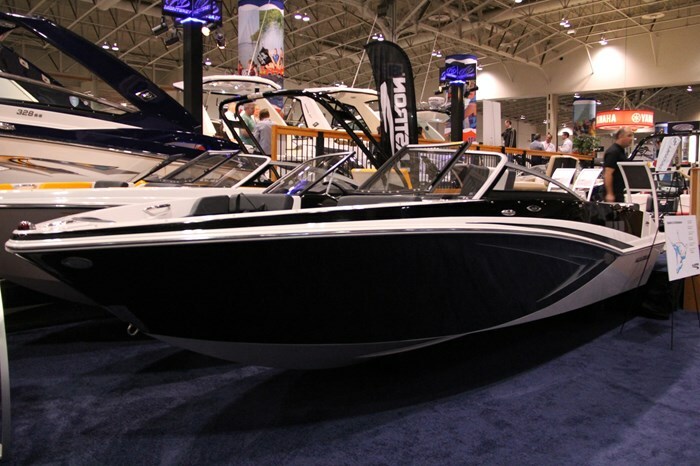 In all, Glastron offers a total of twenty-eight models of bowriders, sport boats, cuddy cabins, and cruisers ranging from sixteen to twenty-nine feet in four series for 2015. Glastron says the “Revved-up styling, bold colors, distinctive graphics and adrenaline-fueled upgrades set the GTS…” apart. The GTS 205 rides on Glastron’s proven SSV® (Super Stable Vee) hull design with a smooth riding commendably deep-vee transom deadrise of 21-degrees. It is constructed with fibreglass stringers and integrated swim platform complete with standard “soft-step” mat with logo. An optional lower level extended swim platform, also with the mat covering, is available. A transom-mounted stainless steel ski-tow eye is standard as is a recessed and covered stainless steel telescoping boarding ladder. The GTS 205 has three very striking two-tone hull and deck in-gel colour schemes complete with graphics available in Sunburst Orange, Jet Black, or Laser Red with corresponding interior Aquaflex™ vinyl colours in white/black/orange or white/black/red. 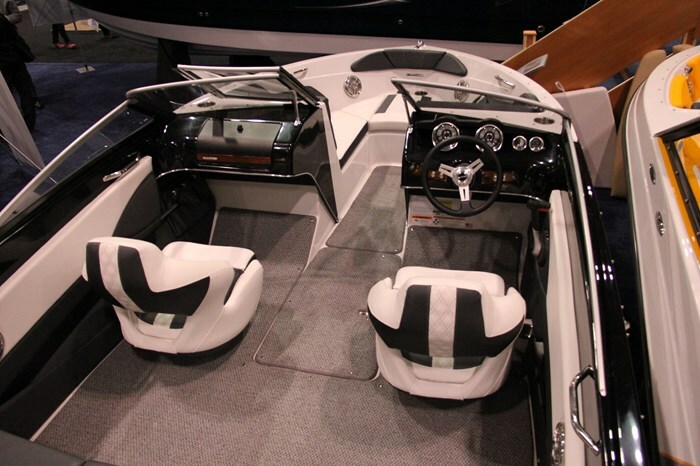 The sporty interior layout offers helm and companion ventilated, supporting, and adjustable helm and companion bucket seats plus a full-width stern bench seat with carpeted storage below. 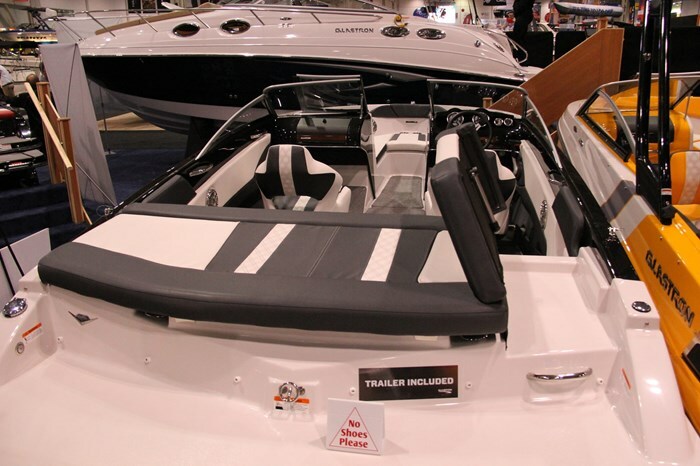 With the starboard side stern bench seat cushion removed and the starboard side portion of the double-wide transom sundeck propped up into the lounging position, a handy transom walk-thru to the swim platform is created. Additional storage is built into the cockpit sides plus a centre cockpit in-floor watersports accessory locker. A glove box is built into the passenger helm. The very sporty curved glass, walk-thru windshield can be optionally converted to Glastron’s even sportier “roadster” look by requesting the windshield side wings be removed. Three bottom cushions fill the colourful U-shaped bow seating area standard with surrounding upholstered and padded backrests, including on the forward faces of the two helms thus providing forward-facing stretch-out lounging. Cupholders are provided along with stereo speakers and grab handles. Carpeted storage is provided under all three seat cushions. The helm of the GTS 205 continues the overall sporty look of this boat with two front-and-centre Glastron custom GTS fog-resistant, yellow-faced multi-gauges complete with effective dash-top non-glare eyebrows. One of these gauges provides a speedometer with fuel gauge and voltmeter while the other is a tachometer with engine temperature and oil pressure. Tilt steering is standard and the DC switches are unique pull-knobs. Standard entertainment is provided by a Sony® AM/FM/CD player with Bluetooth connectivity, an MP3 port and a total of four speakers. This can be optionally upgraded with a subwoofer and transom remote. Base power for the GTS 205 is your choice of a 220 horsepower MerCruiser® 4.3 L MPI with Alpha outdrive or a 225 horsepower Volvo Penta® V6-225 with an SX outdrive. There are additional choices up to a 300 horsepower MerCruiser® 350 MPI with a Bravo I outdrive or a 300 horsepower Volvo Penta® V8-300 with an SX outdrive. Other notable standard equipment includes a Glastron custom-matched single axle bunk trailer with swing-away tongue and tongue jack, and rigid black plastic rub rail with chrome insert. The standard trailer may be optionally deleted if not needed. 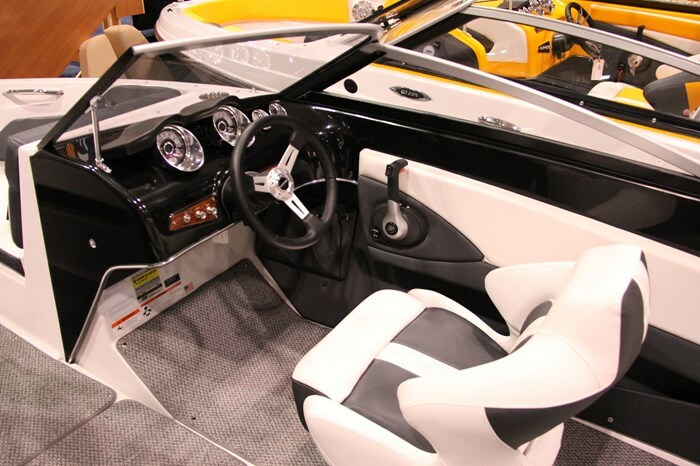 Notable optional equipment includes an XL Package which itself not only includes a bow scuff plate, a flip-up bolster on the driver’s bucket seat, pull-up cleats, snap-in cockpit carpet, stainless steel beverage holders, grab handles, and speaker covers, but also includes the Convenience Package which itself consists of an hour meter and depth sounder. Some of the above options within the packages are available as single options. 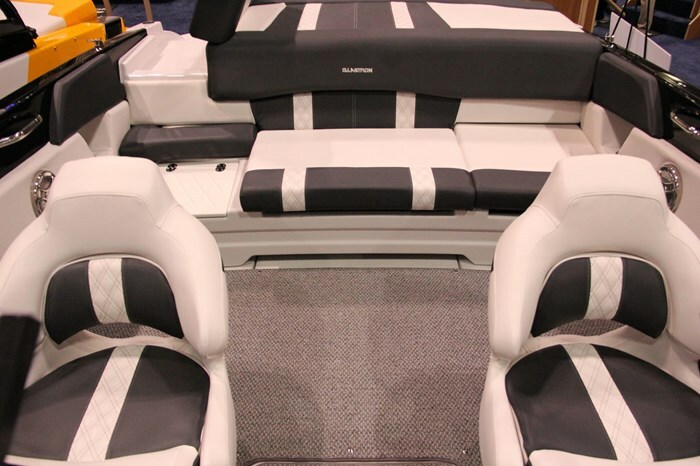 Other options include bow filler cushions, a bimini top plus various other canvas covers, a galvanized trailer upgrade, and perhaps one of the most sought-after options, a hinged wakeboard tower.